By Rebecca Hauder, R.N., M.Ed. If you’re looking for a thoughtful, informative and beautiful bereavement gift, consider purchasing our book: The Nature of Grief: Photographs and Words for Reflection and Healing. The recipient will experience the healing power of nature as they reflect on the scenic, color photographs and accompanying thoughts in this compact, easy-to-read book. 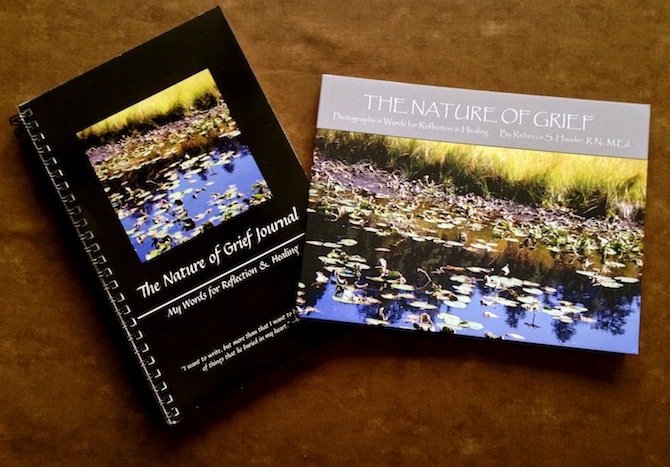 Each of the 12 sections, dedicated to a specific grief-related topic, includes an accompanying nature photograph, a fitting quote, and a brief commentary related to grief, taking into account the short attention span of most bereaved. The writing is educational, giving the reader a variety of practical suggestions for negotiating their grief journey. The author, a Registered Nurse and Professional Counselor, draws from her extensive experience in supporting the bereaved, both in the hospice setting and in her private counseling practice. Her passion for photography has been blended with her life experiences in these eloquent and beautiful pages. This will make a wonderful gift for yourself or anyone who is grieving the death of a loved one. International orders and orders over $700: Email info@resourcesforgrief.com to determine shipping costs. Organizations affiliated with MHS Alliance: Enter your access code to view prices and place an order. 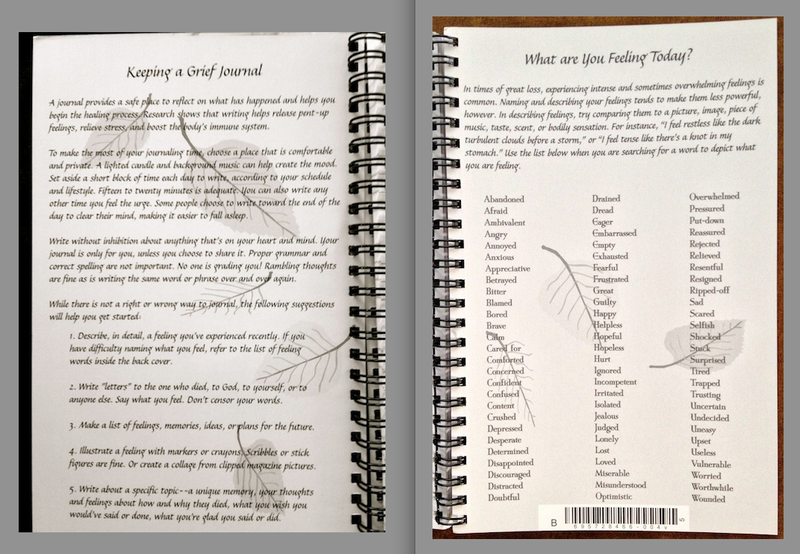 Encourage healing from loss by giving the bereaved this lovely spiral-bound Journal. 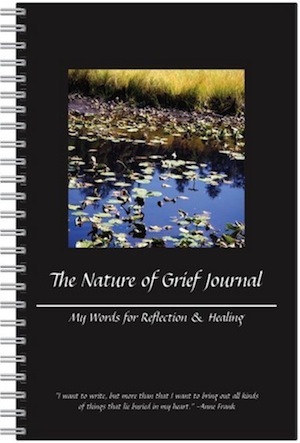 The Nature of Grief Journal: My Words for Reflection and Healing includes suggestions for beginning a grief journal and a list of common feeling words for easy reference. The cover design makes it a lovely companion to our book The Nature of Grief: Photographs and Words for Reflection and Healing. 80 blank pages are conducive to words as well as pictures and doodles. If you wish to purchase a book and journal for a friend or loved one, we’ll be happy to include a coordinated gift card. Informational Magnets -- "Self Care for the Grief Journey"
“Thank you for the little book...I found it very helpful! I'm glad to know what are "normal" symptoms and some strategies to deal with them. I really liked the fact that it was simple and direct without a whole lot of extraneous grief philosophy. I am at the point where I just want to cut to the chase and find out what are considered normal symptoms in this situation and how to handle them and what to expect. It is the first PRACTICAL guide I've seen!" "I ordered the book and it arrived today; it is beautiful. Your photography is gorgeous and I know the words have all been carefully chosen." "Our funeral home ordered 125 books to use as a resource for specific grieving clients. We are getting great feedback." "Thanks for your book. I have read and reread it. I carry it with me, and when I have a bad moment I read it again."